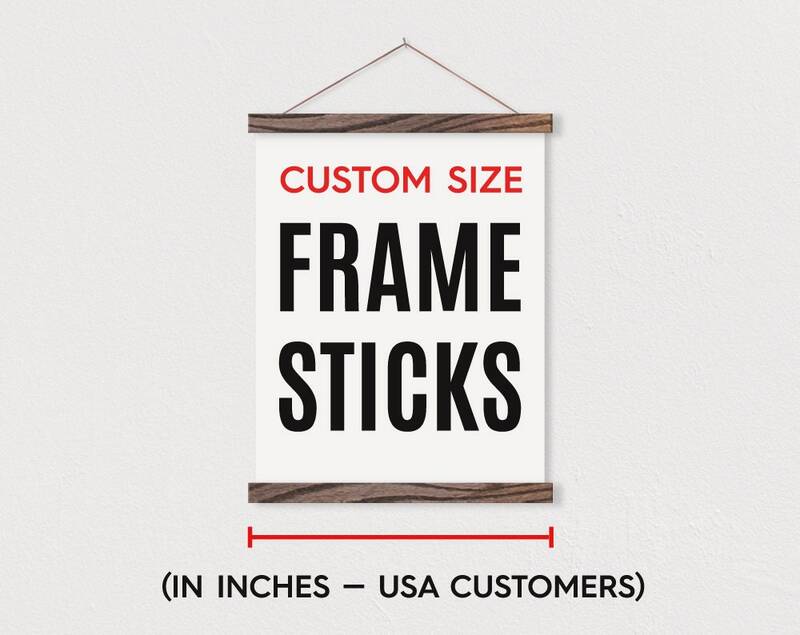 You can order custom size (non-standard) Frame Sticks™ to fit your special sized art. We recommend ordering 1 inch longer than the width of your print so there is about a half inch of overhang on both sides. It does not have to be exact, it is up to you how much overhang, if any, that you would like. Custom size prices are calculated by ordering the next standard size up, then adding an $8.00 custom cut fee. Custom sizes also take 5-7 business days to make. For these reasons, we recommend seeing if one of our 11 standard sizes will work with your art, since they are cheaper and we usually have them ready to ship right away (standard sizes are marked with an * in the dropdown). Custom sizes cannot be returned (standard sizes can be). 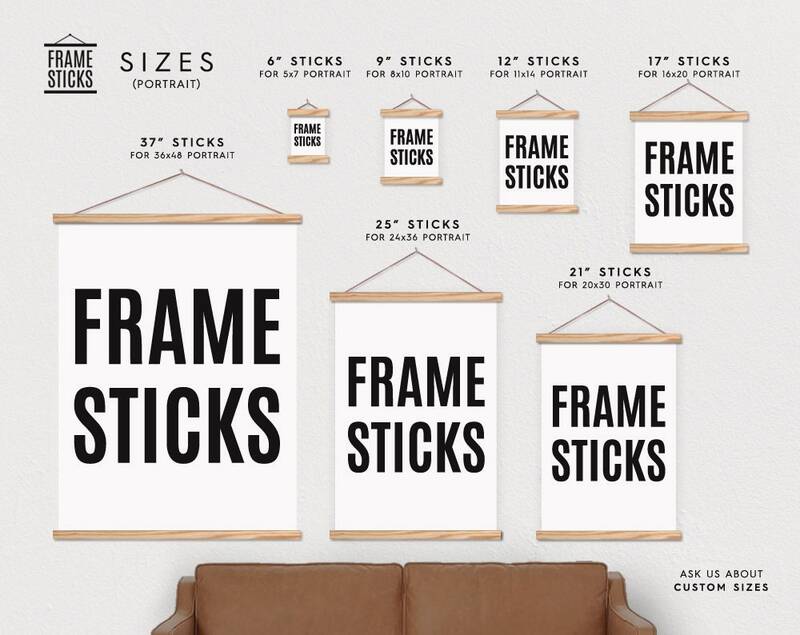 Frame Sticks™ are wooden magnetic hangers to frame art prints and pictures. These are handcrafted in our studio from high quality oak hardwood, in several different sizes from 5" to 49", and finished with your choice of six different stain colors. Each set includes four sticks, two that clamp the top of the canvas and two that clamp the bottom. Strong neodymium magnets are embedded into each stick, which securely grip your artwork, but allow you to easily change out the art whenever you want. Your Frame Sticks delivery will include three string options for you to choose from: faux leather cord, brown jute twine, and white cotton twine. And if you're interested, we also print high quality canvas prints in house that can be included with our Frame Sticks. We print on professional 100% cotton fine art canvas using archival inks. We can print your own photo, or you can choose one of our fresh and unique designs or photos. Let us know if you are looking for something specific, we have over 15 years of graphic design experience and love to help with custom requests. Frame Sticks and Prints (either on canvas or paper) can be purchased separately. Purchase this listing for STICKS only (comes assembled with string and magnets). Browse our shop for canvas designs, or contact us if you would like us to print your artwork on canvas for a more durable wall hanging. Shipping starts at $5.95 per item in the US and $19.95 worldwide*. Each item is made to order and takes 7-10 business days days for production. Standard shipping takes another 3-7 days in the US and 1-4 weeks international and does NOT include tracking. US customers can upgrade shipping at checkout to include tracking and faster delivery. 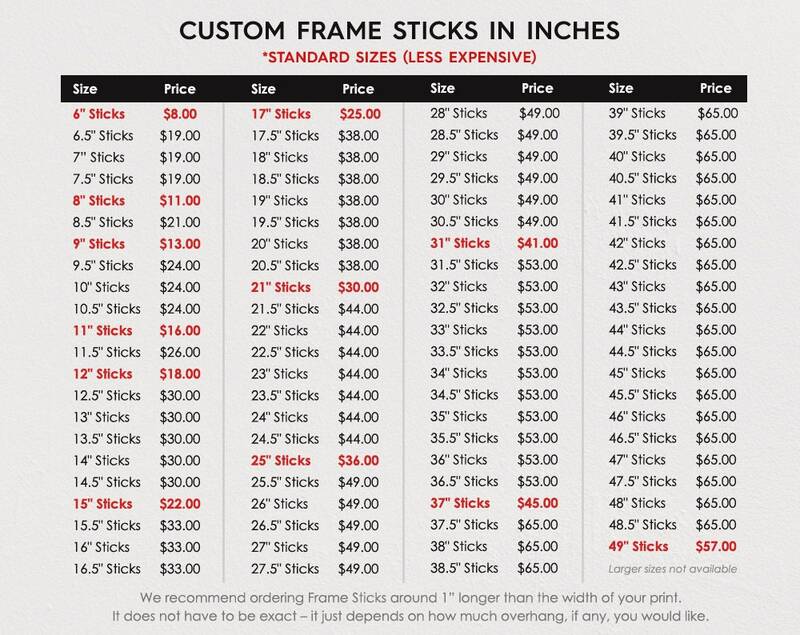 *IMPORTANT: International customers outside of the US ordering any Frame Sticks larger than 30" must choose upgraded Priority Shipping! 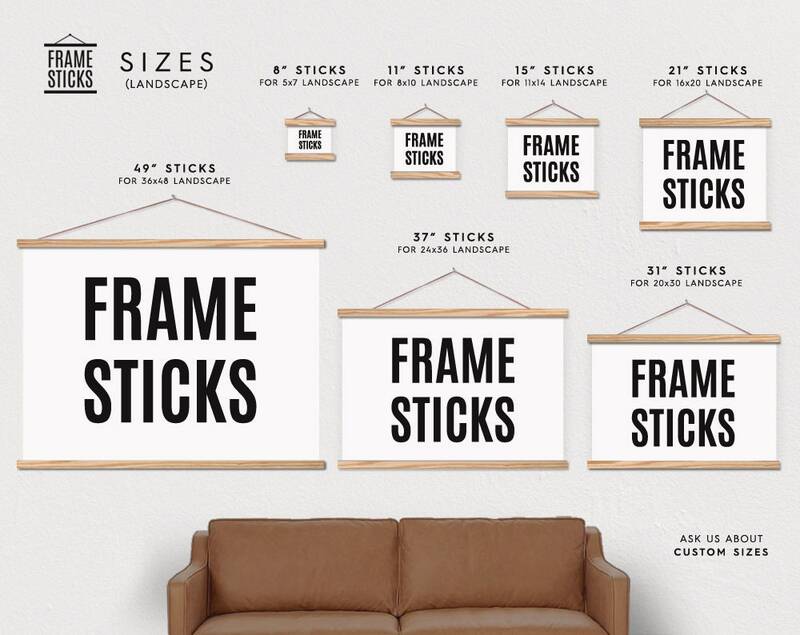 Frame Sticks Disclaimers: Due to natural wood variations, finished stained wood color can vary. Some pieces may come with typical wood characteristics such as knots, streaks, and rough spots. Our product contains small strong magnets, which can be dangerous to children, pets, and people with pacemakers; please be advised and keep product away at all times. Print Disclaimers: Due to differences in monitors, the actual print colors may slightly vary from the colors you see on your digital monitor. Yes, we can customize and personalize your order! Just contact us to get started. Yes! We offer wholesale pricing for large quantity orders of the same exact item. Retailers must follow our branding policy, contact us for details. All of our products are made to order. We do accept returns with a 20% restocking fee.